They were not the right conditions for a fun day’s boating whatever the boat: an onshore wind of 15 to 20 knots, probably nearer 20. 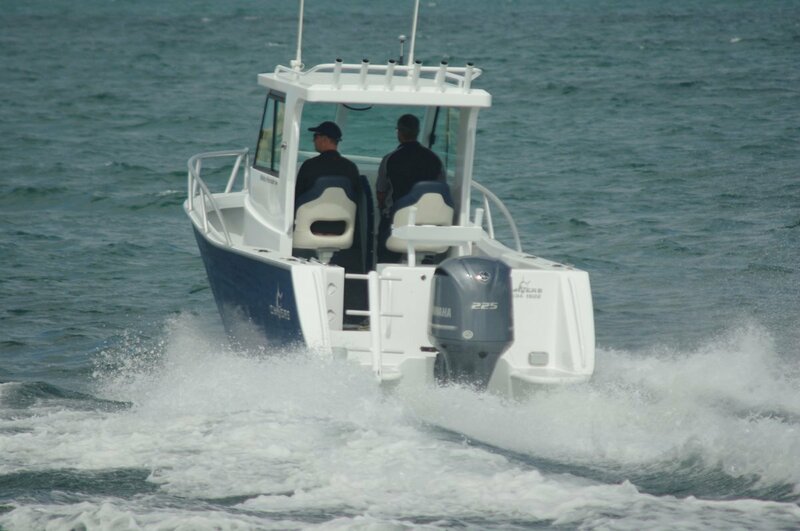 On the other hand, if you decided to bite the bullet one of Chivers’ Shark series boats would be a good choice. These boats have picked up a deserved reputation for coping well with the rough stuff. Our boat was a White Pointer, specifically a 710WA/HT meaning a 7.1 metre walk around hardtop. The Shark range is in a constant state of evolution or perhaps, by this stage of development, refinement is the better word. Every new boat shows the further result of thought and experience – of both the builder and customers. The White Pointer under review demonstrates this philosophy. Fishermen and divers always made up the mass of customers for Sharks and this example has new features to make life easier and more productive for them. The centre cab strikes a balance between internal room and usefully wide side decks. These have two steps on the way to the foredeck. The first used to be square at the cab’s rear, but is now sloped back in a mitre. This gives easier movement out of the cockpit, aided by vertical rails on the cab and conveniently placed side rails. At the other end swim/boarding platforms extend well aft each side of the motor, handy for both swimmers and fishers. 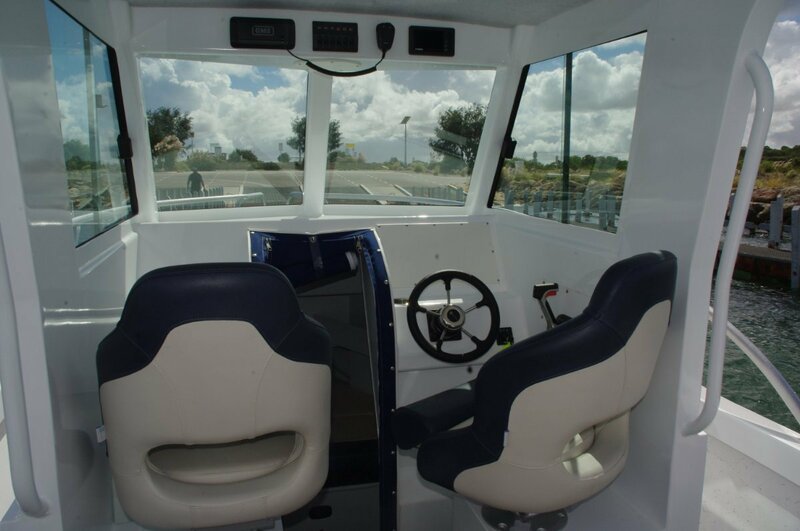 The forward cockpit is a favoured fishing position with no restriction through about 250 degrees of horizon. The desirability has been increased by the fitting at the cabin’s front of a well padded double seat. The driving position’s twin seats are sumptuous armchairs with bolsters, leaving enough room between them for transit to the cab’s interior. The cabin is necessarily on the small side but is still a useful space. It can accept a chemical toilet, and with infills in place is just about sleepable. A zip up door closes it off. 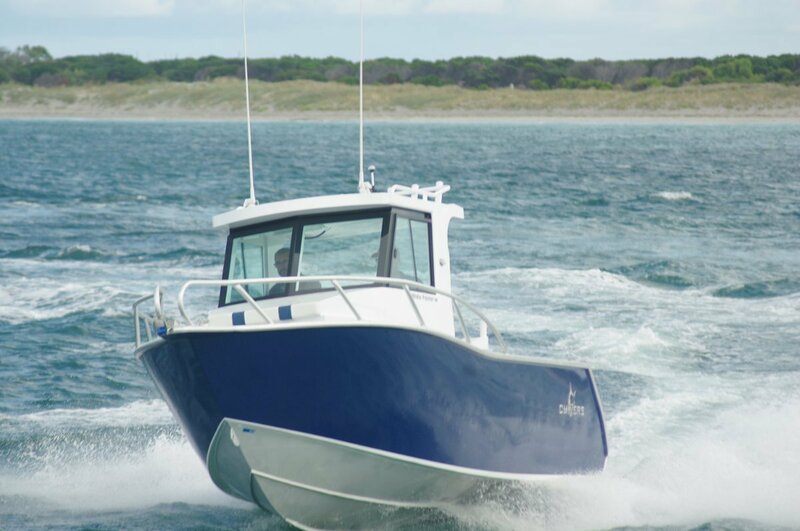 Fishermen are provided with twin 140 litre catch tanks, a bait board, rod holders in coamings, rocket launchers and, of course, access to the full perimeter plus space generally. Swimmers have a scuba ladder – a far heftier device than the telescoping or folding alternatives. The White Pointer plus motor and full fuel tank on its trailer weighs two tonnes. On trips north, and boats this capable deserve such trips, that weight will be exceeded. The boat will be used as a king size trailer for camping gear, food and all the rest of it. Exceeding the load rating of a trailer - and its towing vehicle for that matter – attracts expensive fines. The chances of getting caught are surprisingly high; Chivers knows this and mounts the boat on a trailer with a 3.2 tonne rating. A pleasant extra feature of this trailer is the steel mesh central walkway – far greater ease in hooking the winch strap to the boat’s stem eye. That we were briefly able to use full throttle, equating to 40-plus knots, in the prevailing sea conditions speaks volumes for the Chivers hull. The main part of its secret is a steep deadrise, steep enough to be unstable at rest without its reverse chines and the auto flooding keel ballast tank. Complementing the sharp 5mm plate bottom is an exceptionally strongly braced structure featuring full deck to bottom transverse and longitudinal frames. Even when using silly amounts of throttle this stiffness holds the noise down dramatically. As far as it does have a standard motor the White Pointer usually mounts 200hp, definitely delivering adequate performance. The 225hp Yamaha on the review boat gave that little extra, showing up in throttle opening for cruising and response to power trim. Actual driving was a good experience, aided by first class seats and hydraulic steering. The 260 litre fuel tank has its filler mounted on the centre line within the splash well. This means easy filling whichever side of the fuel bowser you park; a nice touch. The other essential accessory – electricity – is provided by Chivers’ standard twin batteries, one of the greatest enhancers of safety.